Morning in Moldova: Don't Panic! At first glance, the poll is quite scary. AMN would miss out on entering parliament and the three remaining AIE parties would only accumulate 31.2% versus the 30.3% of the communists. This would deliver a bare majority (52 seats) and not enough to elect a president or modify a constitution. The situation improves, however, if you only look at those who say that it is likely that they would vote. Here, the AIE parties would gain 41.5% to the communists 34.5%, delivering them 55 seats. It could be even better than that, for a couple of reasons. 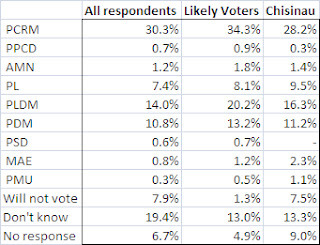 Firstly, the "don't knows" are very unlikely to vote communist. Past history has taught us this. Secondly, the poll was taken at the height of the wrangling with the Venice Commission over the consititutional referendum, when Ghimpu and the Liberals were left floundering trying to defend their position. Since that time, however, I would imagine that the Liberals would, through their championing of justice for those killed and injured on 7/4/09, have won over a few percentage points from both the "don't knows" and the PLDM, who cam out of the video tape issue looking rather silly and complicit. Thirdly, the process of decommunisation continues, although the wins from here on in are likely to be more gradual and harder to gain. While it's not a time for the AIE to panic, it is time for them to do some hard thinking. The lack of unity among AIE parties is obviously costing them support. The hard-core Communist support base appears to be larger and stronger than most people anticipated. Russia is doing its utmost to cause problems for the country and the AIE government. It's not going to be easy. The AIE need to parry the Russian jabs while systematically demounting the communist control that is still so evident in many institutions (e.g. the Prosecutor's office). They also need to display unity around their programme of government and clarity around their communications.. The smaller center-right parties, AMN and MAE, need to get on board with the PLDM and PL, to ensure that their 3% of the vote isn't lost. 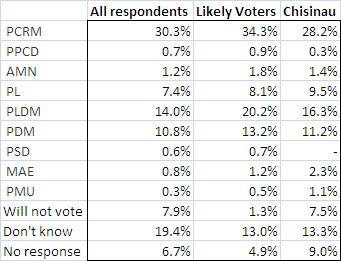 PS: One interesting outcome of the poll was that 80% of the population now recognises Mihai Ghimpu and 25% now has a favourable attitude towards him, whereas the results of the last poll showed him to be unknown and untrusted. Should the President be directly elected, we could see an interesting multi-candidate race. I couldn't agree more; it's time to take back democracy from the elites that have stolen it from us. I am a US citizen. I do however have many friends whom are citizens of Republica Moldova and very, very proud of their country. And I am very, very proud of them. I wish to know Zimbru...how may I help them??? I'm in a similar situation. I hope I'm helping Moldova by bringing its issues to a wider audience through this English language blog. How you can help to a large extent depend on your own skills, experiences, networks. Maybe send me an email at zimbru2009@yahoo.com with a bit more information? 1. Getting independent media (e.g. Timpul, Jurnal, ZDG) into Moldova's villages. Buy some subscriptions, improve internet access. 2. Teaching the Rusofone population to speak Romanian & English. Pay for some teachers to run courses in Gagauzia, for example.